It’s a strange thing about those old narrow streets by the river in the eastern part of the Sofluri district. By day, the area is really quite picturesque and charming, with its cobbled passageways, its ancient doorways, and its lines of hanging laundry between the high stone buildings. But after nightfall… After nightfall, it becomes the horror land, the land of sordid and irreparable crimes, of flinching memories and sickening despair, of fathomless loneliness and dangling feet. 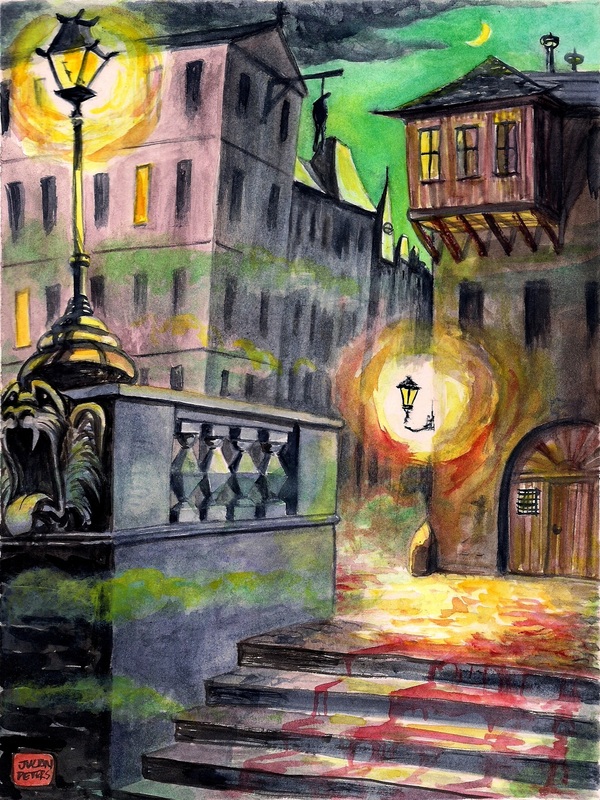 This entry was posted in illustration, Imaginary City, painting and tagged after dark, dangerous neighbourhood, drawing, imaginary city, la citta personale. Bookmark the permalink. Wonderfully eerie illustration — I may need to avoid this neighborhood even before dark falls! That’s great. The Riglers are responsible for brightening my childhood with the gift of one of my all-time favourite (and incredibly macabre) books, “Master Snickup’s Cloak,” and I am glad to return the favour in some small part. Ok, yeah, dude hanging from a rope says all I need about THIS ‘hood!